This hands-on series of courses has a very specific objective – to teach you the most systematic, predictable, and rewarding means of providing comprehensive full mouth restorative and aesthetic treatment ever possible. However, as a result of accomplishing this, you will also learn many other valuable skills, including how to confidently treat Occlusal disease and TMD issues. These goals are achieved using the concepts and methods of The Physiologically Guided Treatment System. The Physiologically Guided Treatment System does this by guiding each element of patient care - Evaluation, Planning, and Treatment. Essential to this system is the DATA Appliance (Diagnosis And Treatment Assisting), which plays a key role in each of these elements. As with most significant accomplishments in life, these goals need to be achieved in a series of steps – with each successive step requiring mastery of previous steps. The Full Mouth Mastery Series accomplishes its objectives and these steps in four sessions. Below are descriptions of each session. Simply stated, there is no other course series like this in dentistry. Whether you are an experienced dentist or a recent graduate, if you aspire to do this type of dentistry, this series is a must for you. DISCLAIMER: “DATA” is a proprietary registered trademark owned by Dr. Karl E Hegyi for dental appliances used for diagnosing and treating Masticatory System disorders. This demonstration is a unique, live patient learning experience. Dr. Hegyi completes a short introduction to the Physiologically Guided Treatment System (PGTS), followed by a live demonstration of a RedAddibration on a patient currently in the DATA (Diagnosis And Treatment Assisting) Appliance. If your goal is to provide care that includes significant esthetic and/or functional restorative treatment, facial pain, or TMD problems, the PGTS curriculum is for you. At the core of this curriculum is the DATA Appliance. This Appliance and the Systems of this series will guide you through the evaluation and delivery of even the most challenging of these treatments – with concepts and methods that are easier, more logical and predictable than ever before. This is where your journey to better dentistry begins. The DATA Appliance is the heart of the Physiologically Guided Treatment System and is used in all three elements of patient care – evaluation, planning, and treatment. In Session I, you learn how to utilize the DATA Appliance to evaluate your patient for comprehensive restorative and aesthetic treatment, as well as TMD and Occlusal Disorders. This begins with learning how to seat and adjust a DATA Appliance. Next, you are taught how to interpret your patients’ response to the DATA Appliance. For most patients, this response represents the single most valuable source of information regarding their functional status. Finally, you learn how to use the DATA Appliance to obtain Verified and Validated mounted casts of your patient – the starting point for any biomechanically and psychologically sound treatment planning. As you will soon realize, learning this method of Verification and Validation will forever change the way you do this type of dentistry. Occlusal and TMD concerns are among the most important, yet poorly understood issues in dentistry. What they have in common is that they are both the result of Masticatory System biomechanical factors. They are important to us because each impacts upon both the comfort of our patients as well as the function and longevity of their restorations. In Session II, you learn how the Physiologically Guided Treatment System addresses each of these critical issues in a manner that makes sense – even if you’ve never treated them before. In Session I you learned the concepts and skills needed to evaluate patients functionally and psychologically using a DATA Appliance. You then Verified and Validated casts of a patient mounted in their most physiologic and stable maxillo-mandibular relationship. It is now time to begin planning and providing treatment based on this information. There is no better way to begin learning this process than with a removable occlusal splint. You first learn which patients can most benefit from occlusal splint therapy (as well as those who would be better served with definitive occlusal therapy). You then learn the skills needed to design, fabricate and adjust a removable occlusal splint fabricated on Verified and Validated mounted casts. After fabricating your splint, you seat and adjust it in your patient’s mouth. Finally, in the weeks following this course, you have the opportunity to monitor your patient’s progress resulting from this treatment. For many TMD sufferers, an occlusal splint is the most appropriate form of treatment. The skills and information gained in this course will be critical for moving on to Session II B - the definitive occlusal adjustment and creation of a Stable Biomechanical Foundation. In addition, methods of adjusting your appliance will also provide valuable insight to properly designing and refining the functional qualities of your restorations (in Sessions III & IV). Appropriate fees and follow-up protocols. For most patients with TMD or Occlusal Disease issues, definitive occlusal treatment is more beneficial than occlusal splint therapy. In Session II B, you apply the concepts and methods of Sessions I and II A to do this. However, this is not about doing a conventional equilibration. Rather, it is about the concurrent utilization of Reductive and Additive reshaping (RedAddibration) to establish occlusal harmony at the most appropriate Vertical Dimension of Occlusion - to create a Stable Biomechanical Foundation. For TMD or Occlusal Disease patients who don’t require extensive restorative or aesthetic treatment, a Stable Biomechanical Foundation is the end point of treatment and represents the most predictable and conservative definitive treatment for most of these patients. It is also the most common application of RedAddibration in most offices and the preferred application to begin learning this process. In this hands-on course, you learn the clinical skills needed to actually perform a RedAddibration. Under the watchful eye of an instructor, you will perform a live RedAddibration on a patient of your own that you have previously evaluated with a DATA Appliance and for whom you have Verified and Validated casts. Make RedAddibration one of the most rewarding and profitable procedures you perform in your office. In Session III, you learn the Physiologically Guided Treatment System’s formula for restorative success – developing the functional and aesthetic blueprint for your patient’s reconstruction. Along with Dr. Hegyi and John Lavicka (CDT and owner of Dental Ceramics Laboratory), you study your patient’s Verified and Validated casts along with their aesthetic photo series. From this information, you develop your initial restoration design on these Verified and Validated casts. This design is then duplicated in your patient’s mouth for a preview – and your patient’s approval (or if necessary, modification). 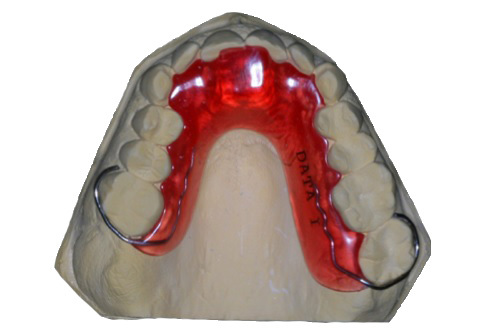 Once approved, you have determined the Vertical Dimension of Occlusion to which you will create your patient’s Stable Biomechanical Foundation when you return to your office. With this Stable Biomechanical Foundation completed, you are now ready to begin tooth preparation. Combined, these advantages result in a less stressful and more rewarding experience for both you and your patient. The variety of treatment phasing and sequencing options for comprehensive restorative/aesthetic treatment as a result of treating on a Stable Biomechanical Foundation – making this type of dentistry possible for many more of your patients. In Session IV, you seat your patient’s final restorations. This is done utilizing ideal seating methods and materials based on your tooth preparation and restoration material types. Next, you adjust the occlusion on these restorations. Although utilizing the methods of evaluation, planning, and treatment previously taught in this series drastically reduces adjustments, it does not eliminate them. As you have previously learned, occlusal harmony is a matter of microns, not millimeters. It is just not possible to fabricate restorations this precisely. Therefore, you will learn how the DATA Appliance assists in an incredibly accurate adjustment of your final restorations – just as it previously assisted in RedAddibration and creation of a Stable Biomechanical Foundation. In addition to learning the importance of precise occlusal harmony in the Full Mouth Mastery Series, you have also learned that nocturnal parafunction is often caused by factors out of our control – and is an important issue. Therefore, you will learn what type of Night Guard is most appropriate for your patient once their restorations are completed. Although your journey in this course series may be over, your application of the concepts and methods has just begun. Whether you never do another full mouth reconstruction or they become a common procedure in your practice, what you have learned will forever change you, your practice and the lives of your patients. How the concepts and methods taught in this series predictably, efficiently, and profitably result in dentistry that looks better, feel better, and last longer! There is a flat tuition cost of $9,950. Included in your tuition is the registration fees for all four levels, the cost for 12 units of lab work (a $4,800 value), all course materials, as well as any additional course costs for all four levels. Payment plans are available. All four levels of this series are mandatory for credit and for your success. You are expected to provide your own patient for this series.